"That's possibly the worst idea I've ever heard," she said. Michelle didn't use these words lightly. She didn't say this when I'd suggested we visit a theme park staffed by 108 dwarfs, or hand-feed live chickens to hungry tigers, or train to become Chinese taxidermists. But Michelle has her limits, too. She draws a line at Philadelphia Cheesesteak Ice Cream. We were about to watch Rambocky X, that legendary double-feature of Rocky VI and Rambo IV. ("A sexagenarian fighter leaves retirement for one last bout, and who knows how it'll end! Well tonight, in back-to-ripped-back awesomeness, it ends TWICE!!!") There was homemade rice ice cream, avocado ice cream and even darling scoops of mango sorbet, but those only represented Thailand and Burma: the countries of Rambo IV. They left nothing for poor Rocky VI. Not the way Philly Cheesesteak Ice Cream would. "Why don't you just make Rocky Road?" Michelle demanded. "Wha? That's not Philly. We need something Rocky would actually eat!" This was uncharted territory. Like Rambocky, I was an explorer. I was a fighter. It was going to be awesome. "This is going to be a disaster," Michelle warned before she went to bed. Okay, she didn't actually say those words, but I could feel them. Had she voiced her thought, she would have added, "A disaster of historic proportions." I nodded, furiously mixing and stirring. There was no way this was going wrong. It was too important. And it went right. Oh how right it went. 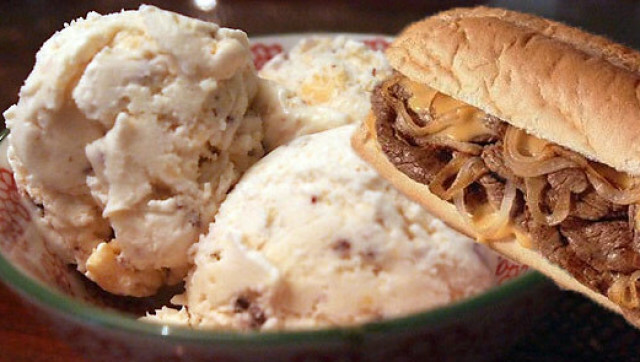 Nuggets of sharp cheddar cheese mixed with crunches of sweet beef, all settled in a gorgeous Philly-style ice cream base. I took a bite, and gasped. "Spectacular," I announced, even though Michelle had long since fallen asleep. I took another bite. "AMAZING!" She still didn't wake up. Oh, well. Granted, it was weird. But it was also something like the greatest weird taste sensation of all time. It was Americana. It was Sweet Jeez! It was Philadelphia!!! Except for a cheesesteak itself, I don't think there could be anything better than this.